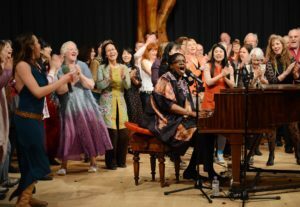 Dr. Kathy Bullock, Professor of Music at Berea College, Kentucky, USA is a world expert and one of the most sought after teachers of African-American songs. She has been to the Universal Hall four times before and has been a huge success with previous participating audiences. Kathy is an amazing singer, leader and pianist, and brings a deep love and extraordinary passion for this music to her teaching. Kathy Bullock will lead both a Gospel song workshop and evening participatory performance. Kathy presents the song workshop from: 9.30am – 4pm. Attendance at the workshop includes free entry to the evening event. This is suitable for anyone who loves to sing and especially if you like Gospel and African-American music. An inspirational and uplifting event where all are welcome and no experience necessary. This evening event will feature many songs led by Kathy and with lots of audience participation.